Home biz features news Western Region Megapolis රනිල් වික‍්‍රමසිංහ රනිල්ගේ කොළඹ ගොඩනගන Western Region Megapolis සැලැස්ම මෙන්න. රනිල්ගේ කොළඹ ගොඩනගන Western Region Megapolis සැලැස්ම මෙන්න. කොළඹ, ගම්පහ සහ කළුතර දිස්ත්‍රික්ක ආවරණය වන පරිදි බටහිර කළාපීය පුරවරයක් (Western Region Megapolis) පිහිටුවීම සඳහා නව රජය විසින් සිය ස්ථාවරය ඉදිරිපත් කර තිබෙන බව ශ්‍රී ලංකා මහ බැංකුව විසින් ඉදිරිපත් කර තිබෙන 2014 වාර්ෂික වාර්තාවේ සඳහන් වේ. මේ අතර, පසුගියදා කැබිනට් මණ්ඩලය විසින් අනුමත කළ යෝජනාවකින් කියවුණේ මහ කොළඹ ප්‍රදේශය හා බස්නාහිර කළාපය සංවර්ධනය කිරීම වෙනුවෙන් 2004 වසරේදී සකස්කළ බස්නාහිර කළාප සංවර්ධන සැලැස්ම (Western Region Megapolis) වර්තමානයට ගැලපෙන පරිදි සකසා ගැනීමටත් ඊට ආදාළ ක්‍රියාමාර්ග ගැනීමටත් කැබිනට් අනුමැතිය හිමිවූ බවයි. මෙම යෝජනාව කැබිනට් මණ්ඩලයට ඉදිරිපත් කර තිබුණේ අග්‍රාමාත්‍ය රනිල් වික්‍රමසිංහ මහතා විසින් වන අතර බස්නාහිර කළාපය සහ කොළඹ නගරය දකුණු ආසියාවේ කැපී පෙනෙන නගරයක් බවට පත්කිරීම හා කළාපීය මූල්‍ය හා ව්‍යාපාර කේන්ද්‍රස්ථානය බවට පත් කිරීමට මෙම සැලසුමෙන් යෝජනා කර තිබේ. මෙම සැලසුම එක්සත් ජාතික පක්ෂ රජය විසින් 2004 වසරේදී ශ්‍රී ලංකා ආයෝජන මණ්ඩලයට භාරදී තිබූ අතර රජය වෙනස්වීම නිසා ක්‍රියාත්මක කර ගැනීමට නොහැකි විය. සිංගප්පූරුවේ CESMA සමාගම විසින් ගෘහ නිර්මාණ ශිල්පීන් සහ නගර සැලසුම්කරුවන්ගේද සහාය සහිතව ගොඩනැගූ මෙම සැලසුමට අනුව පිටකොටුව ආශ්‍රිත ප්‍රදේශයේ ව්‍යාපාරික මධ්‍යස්ථාන (business centres) පිහිටුවීමටත්, බේරේවැව ආශ්‍රිතව විනෝදාස්වාද පහසුකම් (recreation and entertainment) ගොඩනැගීමටත්, කොම්පඤ්ඤවීදිය ආශ්‍රිතව සාප්පු සංකීර්ණ (shopping) ඇති කිරීම ඇතුළු මුළු බස්නාහිර පළාතේම ඒ ඒ ස්ථානවල සංවර්ධන කටයුතු සිදුකිරීමට යෝජනා කර තිබේ. මෙම සැලසුමට අනුව කොළඹ නගරයේ පැල්පත් නිවාසවල සිටින ජනතාවට තට්ටු නිවාස යෝජනා ක්‍රමයක් ඉදිරිපත් කර තිබෙන අතර සැලසුම වසර 30 ක් පුරා ක්‍රියාත්මක කිරීමට නියමිතය. Western Region Megapolis සැලසුමට අනුව කොළඹ ප්‍රධාන ප්‍රදේශ, කළාප 12 කට වෙන්කරන අතර අළුතෙන් නගර ඉදිකරන ප්‍රදේශ, හරිත කළාප, නව නිවාස ගොඩ නගන ප්‍රදේශ හඳුනා ගනු ඇත. මෙම සැලසුම පුද්ගලික සහ රාජ්‍ය අංශය ඒකාබද්ධවී ක්‍රියාත්මක කිරීමට සැලසුම් කර ඇත. සිංගප්පූරුවේ විදේශ අමාත්‍ය කේ. ෂන්මුගම් මහතා පසුගිය පෙබරවාරි මාසයේදී මෙරටට පැමිණි අවස්ථාවේදී සිංගප්පූරු සමාගමක් විසින් නිර්මාණය කළ මෙම සැලැස්ම ක්‍රියාත්මක කිරීමට නව රජය විසින් සහයෝගය ඉල්ලා සිටියේය. මෙම සැලසුම පිළිබඳව වත්මන් අග්‍රාමාත්‍ය රනිල් වික්‍රමසිංහ මහතා විසින් 2011 වසරේදී “සන්ඩේ ටයිම්ස්“ පුවත් පතට රචනා කළ ලිපියක් මෙන්න! “Colombo is Colombo – you should be proud of the city,” a Singaporean remarked at a meeting that I had summoned as Prime Minister in 2003 to discuss plans for developing the city of Colombo. The Singaporean was a member of the team sent by the Government of Singapore to study the ‘Colombo Metropolitan Regional Structure Plan 1998′ developed by the Kumaratunga government in the late nineties. The team was to collaborate with the Sri Lankan team in preparing a Concept Report which would absorb the rapid development that was anticipated after the 2002 Peace Accord with the LTTE. The CESMA final plan, developed by the Sri Lankan and Singaporean team, proposed a Western Region Megapolis – stretching from Negombo to Beruwela with the city of Colombo as the core. It was an ambitious plan to convert the hitherto unplanned Western Province into a major megapolis by 2030 with an estimated population of 8.4 million (an increase of 3 million). The rising Asian economies were all converged in big cities such as Seoul, Tokyo Beijing, Shanghai, Hong Kong, Hanoi, Bangkok, Jakarta, Kuala Lumpur, Dhaka, Delhi, Mumbai, Chennai, Kolkata and Karachi – each city housing populations that range from five to fifteen million. These densely populated, large urban cities made economies of scale possible and thereby provided an impetus for growth. In comparison, Sri Lanka did not have a large metropolis to power large-scale growth. The CESMA Plan provided the answer – a megapolis of 8.5 million, which was envisioned as the only planned city in South Asia. This would give us a definite advantage vis-à-vis the other economies in the South Asian region. Colombo has the potential to become the base for many foreign enterprises that were conducting business in the southern part of the Indian Sub Continent, as Chennai, Bangalore, Trivandrum and Cochin were only an hour’s flight from Colombo. The Western Region Megapolis would also become the hub for South India and the Maldives. The rapid development of Colombo started during the time of President J.R Jayewardene who conceptualized Sri Jayewardenepura as the administrative capital and Colombo as the business centre of Sri Lanka. A master plan for the Colombo Metropolitan Region was prepared at the time but the city had expanded rapidly and the surrounding Western Province cities and small towns had turned into unplanned urban sprawls. This was why Indika Gunawardena as Minister of Housing and Urban Development in President Kumaratunga’s government presented the Colombo Metropolitan Regional Structure Plan in 1988. With the Ceasefire Agreement in 2002, the economy picked up and I felt we had to go beyond the Structure Report, given the possibilities of the time and our vision for the future. The money was available. The Tokyo Donor Conference had given us over US$ 4.7 billion – a part of which was set aside for the development of Colombo. I requested assistance from the Singapore government as they had just finalized their own Concept Plan 2001 and Master Plan 2003 for Singapore. Their plans were internationally acclaimed, and envisaged Singapore becoming a Global Business Center as well as a fun filled and exciting city. 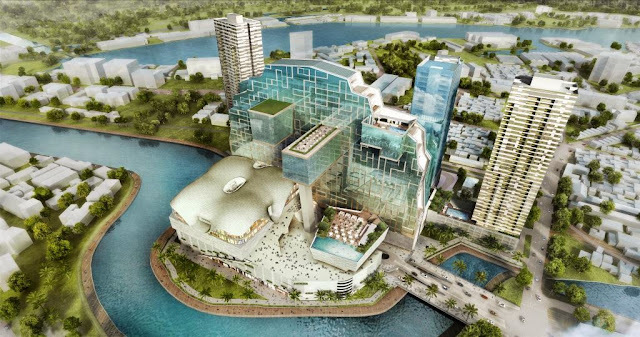 In fact, having developed Singapore according to these specifications during the latter part of the decade they have now presented their Concept Plan for 2011. At the time, Prime Minister Goh Chok Tong was good enough to send a team, which worked with our planners in the BOI, the UDA, the Colombo Municipality, the Tourist Board and other relevant agencies. The Sri Lankans and the Singaporeans made an excellent team. The Decentralization Concept – to direct development to the Eastern, Southern and Northern parts of the region with Colombo as the core. The City in the Garden and Green Finger Concepts – to develop a garden city and create a green network to separate the different zones. A Live-Work-Plan Concept – to promote a better quality of life by enabling many people to live close to their areas of work. Based on these principal planning concepts, the team developed a structured plan, which consisted of a downtown core, an inner necklace from Moratuwa to Jaela and an outer necklace from Negombo to Homagama and Kalutara. The Colombo Core was to be a high-density area with major facilities. The Inner Necklace was to consist of self-contained townships and was to be a medium-density area. The Outer Necklace was conceptualized as low-density townships. The Colombo core area was to have an estimated population of 2 million. Fort, Pettah, Kollupitiya and Maradana with a total land area of over 1033 hectares were envisaged as the New Downtown containing the Business and the Financial District. Slave Island and Galle Road were to be the shopping areas. There was also land earmarked for high-rise residential areas. The Army headquarters and the land around the Beira Lake were to be allocated for Arts, Recreation and Entertainment. The business district was to be extended by filling the sea (and adding over 20 hectares to the city) from opposite the turn off to the present Ministry of Defence to the South Port extension, allowing for the historical landmark of the Galle Face Green to continue overlooking the sea. This was the first ever proposal to extend the city to the sea. Yet many are now claiming authorship for such proposals. The Port, Mattakkuliya, Grandpass and Kotahena (an area of 928 hectares) were to become the Port City with a Cargo and Logistics hub as well as a large residential neighborhood. The Plan also proposed building a North Port at a later stage. Once the North Port had been constructed, parts of the existing Port were to be converted into marinas, cruise centres and promenades – a pleasure harbor to attract a new type of tourism. Grand Pass, Dematagoda, Borella and the remaining part of Maradana was assigned to be a Downtown Fringe for mixed use with residential clusters. Cinnamon Gardens, Narahenpita and Bambalapitiya (constituting around 1139 hectares) were demarcated as the Civic District, which was to be the heart of Colombo. The Public Institutions were to be located there alongside a large recreational area. The Independence Square was allocated a large open space. 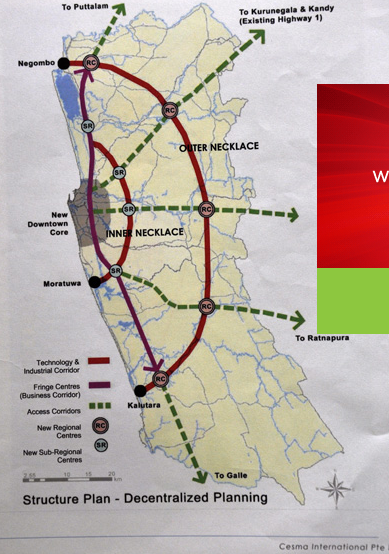 Wellawatte and Kirilapone together with Dehiwela and Nugegoda (consisting of 1186 hectares) were to be the Suburban City Centre. These were the main proposals for the City of Colombo. Lands in the Western Region were earmarked for Employment Generation, a Business Corridor for trade and services, a Technology Corridor and an Industrial Corridor. The Plan identified 12,000 hectares, for Industrial land use (an increase of about 6,000 hectares from the current land available). The Bolgoda Lake and the Negombo Lagoon were labelled major tourist areas of the megapolis. At the time, I was concerned about the livelihoods of those around the Dehiwela Zoo once the zoo was moved out. I was pleasantly surprised to find a proposal for a Nature Theme Park to replace the Dehiwela Zoo. Of course, such massive expansion requires new infrastructure and the Plan addressed these concerns as well – including the crucial threat of flooding. It proposed a number of drainage schemes – including four large schemes: Colombo Storm Water Drainage Plan, Bolgoda, Jaela Basin Scheme and the Kaluganga Basin Scheme. These would result in an increased drainage capacity, the conservation of flood retention areas, new ponds as well as the rehabilitation of existing canals. The need for good public transport was also addressed. The road network plan envisaged expressways with 6-8 lanes by 2030. The Plan projected electricity consumption to reach 52,417 GWh in the Western Region by 2030 and addressed these needs as well as the further modernization and expansion of the airport and the port. Given that Colombo was to be a Port City, the 2003 capacity of the Port of 1.7 million TEUs was to be increased to 20 million TEUs by 2030. The team reiterated the fact that the present infrastructure was inadequate, and that the government’s first priority must be the development of infrastructure without which the Megapolis would not become a functional reality. With the appropriate infrastructure in place it would be possible not only to re-house the low-income households in better housing schemes in the same areas but also to provide housing to the commuting middle-class who want to live and work in Colombo. This would reduce the strain on the transport service. The Plan was completed in April 2004. By then I had ceased to be the Prime Minister. Therefore the official copies of the three-volume Plan were handed over in May to the then Prime Minister Mahinda Rajapaksa. For reasons best known to the UPFA Government they did not proceed with these plans. In fact, the UPFA Government followed a policy of benign neglect of Colombo until the current local government elections. As a result we have had annual dengue epidemics and recurrent flooding of the city. If the Government was sincere about developing Colombo they should have gone ahead with the megapolis plan and put in place the urban infrastructure required for a megapolis. Instead, they erased the Plan from government records. Last year the government announced what it called a ‘Colombo Development Project’. It is actually a development project without a Master Plan. The current UDA website refers to Sir Patrick Abecrombie’s Regional Plan for Colombo Region (1948), The Master Plan for the Metropolitan Region (1978), the City of Colombo Development Plan (1985) and the Metropolitan Region Structure Plan (1998). The UDA is completely silent on the Western Region Metropolis even though it admits that a review of urban development of the last twenty years since the publication of the Colombo Master Plan shows several significant instances of unplanned development. Why do we need to reinvent the wheel when the Western Region Metropolis Concept Plan is available and can be the basis for consultations with Colombo’s stakeholders? If need be, the UDA can, after consultation, put forward a Master Plan which will include all the requisite modifications and amendments. A Master Plan is required to guide development in each sub-division and integrate it into the overall planning concept. In this instance, the Government has put the cart before the horse. The Chair of the UDA, Janaka Kurukulasooriya states that the Government is offering state land upfront on a 99-year lease without tender procedures. The allocation of state land for sale is the third step in city planning, and takes place only after the development guide plans are finalized. It is glaringly obvious that the government’s real intention is not the development of Colombo or to make the city more orderly and economically diverse, but to dispose of state land to pre-selected buyers. The Western Megapolis Plan made provision to re-locate low-income residents of the city within the city preferably within the same planning areas. By providing them with medium and high-rise accommodation within the city, 50% of the land now occupied would become available for re-development. Many of these low-income residents either work in the private sector or are in gainful self-employment. They have either a Swarnabhoomi deed or permits issued by successive governments on the understanding that this land could be exchanged for suitable alternate accommodation. These residents of Colombo have invested their monies and built their own houses on this basis. The government roadblocks and barriers were removed in Colombo – a necessary outcome – after the war ended. The Government launched a so-called beautification programme, which consisted of demolishing parapet walls of public institutions in the Cinnamon Gardens, Fort and Slave Island. There was one exception: the Rupavahini Corporation. This was symbolic. It would have been much better if the walls erected around the media to muzzle media freedom were demolished. Then under the guise of the Development Project the government started demolishing low-income houses – Colombo’s most vulnerable. The residents were to be relocated either in the Panaluwa (the fringe between Homagama and Avissawella) or Attanagalle, and the Colombo land was to be made available for development. No doubt the UDA Chair was true to his word. The lands that were occupied by the Army Headquarters were sold to Shangri La (a well known hotel company) and to CATIC (a Chinese Company reputed for building aero planes). The Colombo Commercial Company complex was sold to an Indian party – Indocean Developers Pvt. Limited. The Sunday Times of 14 August 2011 referred to it as “a sale shrouded in secrecy.” The Indian party had been promised a part of the Galle Face land and therefore named their company Indocean Developers. Their tower was to be called the Indian Ocean Tower. As they could not be given a block of land facing the Indian Ocean, a block of land in front of the Beira Lake was made available. Now Sri Lanka will have an Indian Ocean Tower facing the Beira Lake. Another first by the Government! This was followed by the sale of Tharawatte – a low-income housing project situated behind the CISIR – to another Indian Company, Rank Limited. What is the hurry to sell state land when property markets throughout the world are depressed? If the Government is to achieve value for money it should be done only after 2013. Why is the land being sold hurriedly in a non-transparent manner on a first-come basis without any publicity? It is alleged that the Tharawatte land was sold at Rs. 1.5 million per perch. The UDA has not denied the allegation or made public the agreement with Rank Limited. Is this the true price of a perch of land adjoining six leading schools (D S Senanayake, Sirimavo Bandranaike, St. Bridget’s, Ladies, Royal and Thurstan), the BMICH, the Performing Arts Center, the Lionel Wendt, the Colombo University, many Embassies, the Independence Square, the SLC, a cricket stadium and many clubs and restaurants? Who benefits from these deals? There is another plan promised by the UPFA Mayoral candidate Milinda Moragoda who stated that he will “present a comprehensive plan for the long term development of the city of Colombo where all stakeholders in the City can make Colombo reach its full potential.” However, he made no reference to the Defence Secretary’s Development Plan. The UPFA Mayoral candidate went further and stated that no developments have taken place in Colombo in the last few years thereby disowning the UPFA Plans. But one thing is clear : they have not produced a comprehensive Master Plan for the development of Colombo. It is because they have no plans. In the meantime, the government is engaging in the greatest asset stripping exercise in Colombo at the expense of low-income residents. Instead of township development, which could have given low-income residents a higher income and a better quality of life, they cast crocodile tears on the plight of these residents while demolishing their houses and selling state lands to so-called Chinese and Indian Property Developers. The losers are not only the low-income residents, but the whole country has lost out in the grand land scam of Colombo. The CMC elections have given the UNP an opportunity to expose the land scam as well as to make the city aware of the Western Region Megapolis Plan. A UNP controlled Colombo Municipal Council will publish this plan. Copies will also be made available to the other local authorities in the Western Province as well as the Provincial Councils. We will call for consultations with all interested parties on the plans for the city of Colombo. We hope it will trigger similar consultations in all concerned Local Authorities in the western region. We will present an amended Plan based on our consultations. The government would then have to either accept the plan – involving all stakeholders – or come up with a better plan. The UNP controlled CMC will work with the government on either basis. We reiterate that the first step should be the development of urban infrastructure. The citizens of Colombo deserve a better deal than a land scam under the guise of development. Firstly, all of them must be taken into confidence and consulted in preparing plans. Secondly, there must be a place for everyone including the low-income earners as well as the Sinhalese, the Tamils, the Muslims, the Burghers and other minorities. Thirdly, the wishes of the residents must be respected. In the last four years the UPFA has failed to do. What we are witnessing is not the development of Colombo but forced evictions, demolished homes, and the unheeded heartbreak of displaced citizens. The UNP will turn this around by making you the stakeholders of Colombo. Together let us make Colombo the preeminent city in South Asia.